Making the right borrowing decisions when it comes to getting a new mortgage is critical. As we teach every day when meeting with homeowners and new home buyers, how you handle the financing of your home impacts virtually every other aspect of your financial life! Here is a short quiz to help you start the process of learning how to make smarter decisions when borrowing, and repaying, a mortgage. 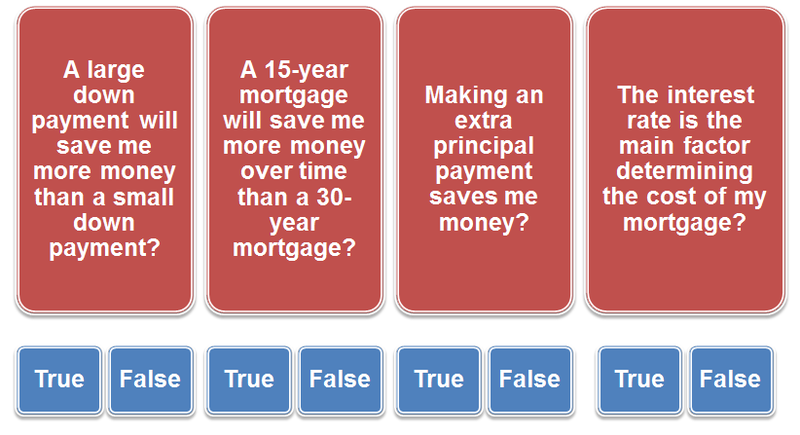 As you read each question, how would you answer…TRUE or FALSE? For example, when deciding between a larger down payment and a somewhat smaller one, you must decide what the real benefit is for you by investing it into your home instead of somewhere else. If you don’t use all of your money for the down payment, what else might you do with it? Perhaps paying off some high interest credit cards or other non-tax preferred debt makes the most sense. Other clients quickly realize through our process that this might be the optimal time to jump start a college savings plan for their children, or catch up on their retirement savings with some of their cash. When deciding between a 15-year or a 30-year mortgage, or whether or not to pay extra money each month toward your mortgage payment, you must know the true cost of borrowing, and what you really save when repaying your mortgage faster. Without this awareness, it’s impossible for a homeowner to know whether it is smarter to pre-pay their mortgage, invest in their retirement, or pay off other consumer debt. In addition, the interest rate is only one of many important factors that determine the cost of your mortgage…now and over time. My point in providing this quiz is to help you as a homeowner, realize that there is a lot at stake in borrowing and repaying a mortgage. And since most homeowners are making these important borrowing and repayment decisions for 30, 40, or even 60 years of owning real estate, making the wrong decisions truly do compound over time! This is why The BorrowSMART Process™ we have designed helps homeowners and home buyers compare all of their options, side-by-side, to see what choices make the most sense now and over time. If what you thought to be true about how you handle the financing of your house turned out not to be true, when would you want to know? This entry was posted in Money and tagged Aspire Mortgage Group, Financial Planner, financial planning. Bookmark the permalink.